Are Skin Tags Around The Neck Caused By Wearing Necklaces? Constant irritation to a particular area seems to be a significant contributing factor, especially in people who are overweight. This irritation can be due to necklaces, shirt collars, or anything else that could be rubbing in the area. There is sometimes a family history, but this is more likely due to medical conditions such as diabetes or obesity. Anyone can develop skin tags due to friction. Are They A Part Of Aging? Skin tags can develop at any age, but about 60% of people have developed skin tags by the age of 70, so there may be an aging component. Where Do Skin Tags Most Commonly Appear? 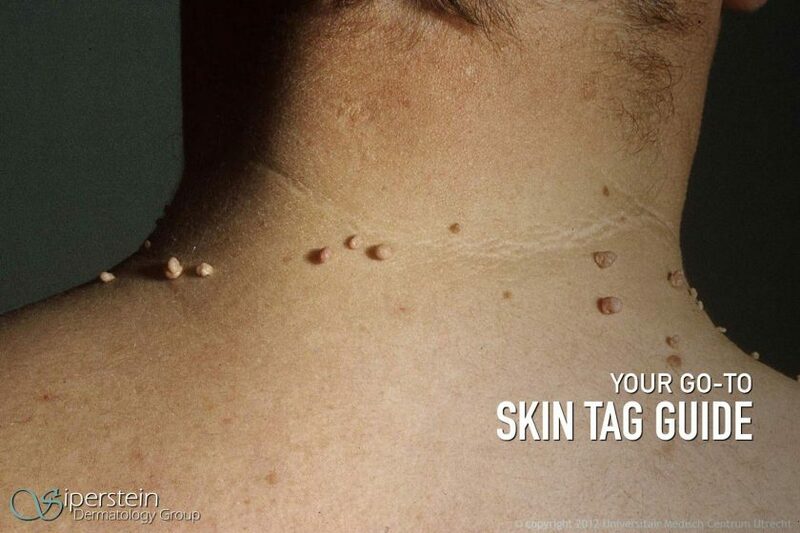 Skin tags can appear singly or in groups but are mostly found in skin folds (e.g. axillae, neck, eyelids and groin). They are also commonly located on the trunk, the abdomen, and the back. Weight loss and decreasing friction may be helpful. Your dermatologist can remove them with a minor surgical procedure. Can You Remove Them Yourself? We don’t recommend removing skin tags yourself for several reasons. It is important to be sure it is a benign growth, as some skin cancers may mimic skin tags. Also, this should be done by a medical professional to reduce the likelihood of complications such as scarring, bleeding, or infection. If it has been completely removed, not usually. However, new skin tags may develop in the same area. Can Skin Tags Go Away On Their Own? Occasionally, they may fall off on their own. Are Skin Tags A Sign Of Something More Serious That Could Be Wrong With My Health? Obesity, dyslipidemia, hypertension, insulin resistance (diabetes), and elevated high-sensitive C-reactive protein are all possible underlying links to skin tags. They may also indicate an increased risk of atherosclerosis and cardiovascular disease. They are usually asymptomatic, and do not become painful unless inflamed or irritated. Should Skin Tags Be Monitored Like Moles For Cancer? Rarely, a skin cancer may develop within a skin tag. It is always a good idea to get an annual skin check and have an exam of any new or changing lesions. Most skin tags are completely benign, but it is important for a medical professional to evaluate them. How Do You Tell The Difference Between A Skin Tag And A Mole? Skin tags and moles can look very similar, as there are some types of moles that are skin-colored and some types of skin tags that are darker. Again, it is important to see a dermatologist to evaluate your skin tags and give options for treating them. Why Is My Skin Tag Bleeding? Most often from friction or irritation, however it is possible that the growth is changing and it should be examined by a dermatologist. Can A Skin Tag Turn Into Cancer? Rarely, a skin cancer may develop within a skin tag. Why Is My Skin Tag Itchy Or Sometimes Has Dry Skin Around It? If I Am Overweight Will I Be More Prone To Skin Tags? I Have A Skin Tag Next To My Eye – Will It Affect My Vision, And How Can I Remove It Without Affecting My Eye? It should not affect your vision unless it is in your line of sight. It can be surgically removed by your dermatologist. I Had My Skin Tags Removed But Now There Are Little Scabs And Scars Left Behind – Will They Go Away? Scabs will go away, scars will fade and may become imperceptible. How Do I Tell The Difference Between A Wart And A Skin Tag? Warts usually have a rough surface and skin tags are usually smooth, but they can look very similar. I Heard Banana Peels Are Good To Dry Out Skin Tags – Is This True? There is no medical evidence to support this. Is Tea Tree Oil Good For Skin Tags? Are There Any Over The Counter Remedies For Skin Tags? There are, however there is no scientific data supporting their efficacy. I have A LOT of skin tags – how many can be removed in one go? Usually, A LOT. It depends on sizes and locations. I Heard That Removing Skin Tags Simply Encourages More To Grow Back – Is This True? Does Diet Play A Role In Skin Tags? No, but obesity can make a person more prone to skin tags, so we do recommend eating a healthy diet. Skin tags are an aesthetic annoyance that are generally a minor medical concern. However, they can easily be evaluated and removed by a boar certified dermatologist. Call Siperstein Dermatology Group to schedule an appointment at (561)-364-7774.